When scientists need to precisely deliver smaller volumes of a reagent, they use a pipette – a calibrated glass tube into which the reagent is drawn, held and then transferred. Glass and plastic pipettes have been the mainstays of biotechnology and life sciences laboratories for decades, and they can be relied upon to dispense volumes down to 0.1 ml. In many cases, scientists need to work with much smaller volumes of reagents, even getting down to 0.1 µl (one ten thousandth of a milliliter, or one ten millionth of a liter!). For such small volumes, they use a micropipette. Almost all micropipettes operate on the same principle: a plunger is to be pressed by the thumb and when released, the reagent gets drawn into a disposable plastic tip. When the plunger is pressed again, the liquid is dispensed. The tip is an important part of a micropipette and allows the same instrument to conveniently work with different samples without washing (as long as we can change the tip during sample collection). Tips are available in different sizes, depending on the micropipette they are to be used with, and the volume they need to dispense. At MICROLIT, you can find the miniaturized Micropipettes designed by our in-house team of product design engineers : MICROLIT LILPETS. 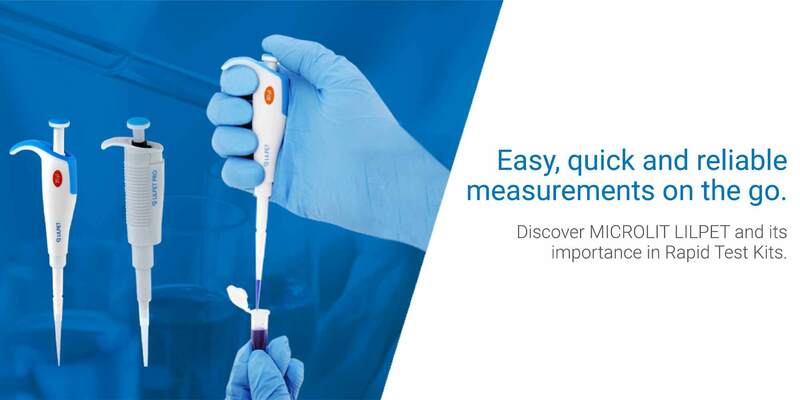 MICROLIT LILPET, a miniature fixed volume micropipette, is a cost-effective high precision liquid handling instrument with an ergonomic and intuitive design that helps in performing sensitive operations with acute reliability in practical laboratory environments. 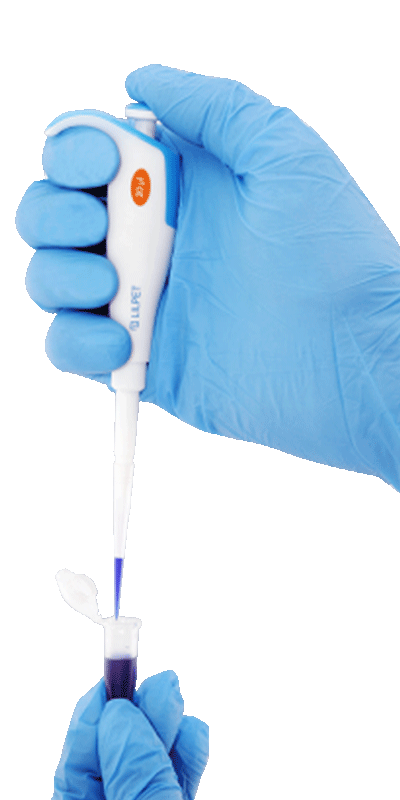 They have a two-step plunger operation that facilitates reverse pipetting and ensures last drop dispensing. It has an optimum length of 130 mm, perfect for high user comfort during pipetting. While using, hold it like a pipette and not a syringe. Its tip cone (5 μl, 10 μl, 20 μl) is designed to accept both micro-tips of 200 μl capacity and ultra-micro tips of as low as 20 μl capacity. The use of the latter significantly enhances accuracy and precision. MICROLIT LILPETS are used extensively in schools for research and experiment purposes. They are useful in mobile laboratories for soil testing and water testing as they enable one to easily go out and collect samples directly from the field. They are specially designed for diagnostic kits commonly known as Rapid Testing Kits. Today, the Diagnostic Kits Manufacturing Industry is growing at a tremendous rate in order to satisfy the ever-increasing need to analyze, determine or detect diseases in living organisms and/or measure the concentration of contaminants in consumer edibles like Beverages & Drinking Water, Milk & Dairy Products and Edible Fats & Oils, etc. Rapid Test Kit is a type of Diagnostic Kit that detects the contamination of Milk Samples by Beta-Lactam and Tetracycline molecules. One of the biggest consumers of these kits are the developing countries. Our specially designed MICROLIT LILPETS empowers such kits with its advanced blend of mobility and accuracy. The biggest Europe based biotech company and our client, is focused on improving food safety with screening solutions to detect antibiotics, mycotoxins, food fraud in dairy, cereal, honey, feed, meat and seafood industries. They use MICROLIT LILPETS in their Drug Residue & Contamination Testing Kits for food diagnostics. A company of Perkin Elmer, uses MICROLIT LILPETS to prepare their Next-Gen Sequencing Library Prep Kits that includes instruments that screen antibiotics in milk, blood and other liquids.